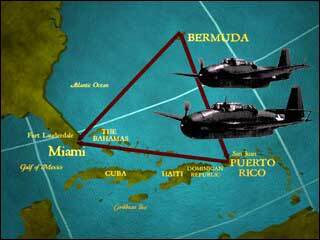 The Bermuda Triangle (also known as Devil’s Triangle) refers to an area in the Atlantic Ocean which lies between the islands of Puerto Rico and Bermuda and the coast off of Miami, Florida in the United States. Rather than describing a passageway between wonderful vacation spots, the Bermuda Triangle is known as the place where ships at sea mysteriously disappear. The Bermuda Triangle phenomenon began in 1918 with the sailing of a grand ship called the Cyclops. On its way to Baltimore, Maryland, the Cyclops seemingly vanished. The United States Navy sent out search ships but they were unable to find a trace of the ship or any survivors. Over the next 50 years, more than 40 ships and 20 airplanes were lost in this area, from private crafts to United States Navy and Air Force vessels. The Bermuda Triangle phenomenon began in 1918 with the sailing of a grand ship called the Cyclops. On its way to Baltimore, Maryland, the Cyclops seemingly vanished. The United States Navy sent out search ships but they were unable to find a trace of the ship or any survivors. Over the next 50 years, more than 40 ships and 20 airplanes were lost in this area, from private crafts to United States Navy and Air Force vessels. Scientists, however, were able to look at natural weather occurrences related to magma activity and shifting Earth plates underground. These can create hurricanes and magnetic storms on the surface which could certain cause damage to ships and confusion to their pilots. Regardless of the logical explanations, it would seem that people would rather believe in the power of the supernatural forces. As such, it is likely that future accidents or disappearances will be attributed to the curse of the Bermuda Triangle.